This page about the most popular fishing charters located in and around Orange Beach, Alabama. We will outline your options and help guide you toward a fishing charter or fishing guide that meets your expectations, group size, budget and experience level. You may continue reading or you may click on the link below that best represents what type of fishing trip you want to experience. Click on the fishing charter below and it will take you to the description about that particular type of charter and the services they offer. Every detail about the charter fishing guides and boats that we represent, exceeds every expectation of our guests. In a time where the deep sea fishing charters appear to be the same, it's our service that sets us apart from the competition. Professionalism permeates throughout our fishing charter operations. Our reputation depends on offering better service and providing a better product. Specializing in private Family Fishing trips for 1 to 6 passengers . Light Tackle, Family Fun. 6 and 10 hour trips available. This is Orange Beach's most popular family friendly fishing charter and is evidenced by reading some of their excellent traveler reviews. If you have 1 to 6 people in your group and you are wanting to experience a private deep sea fishing charter for your family or group, then this is the ultimate of six passenger charters. They offer Light Tackle, Family Fun - "G" Rated, professional environment. The Distraction Charter Boat is docked at Orange Beach Marina. The boat is a big 41' Hatteras Yacht and has a shaded sitting area with air conditioning and a private restroom. A private charter is where you are the only one on the charter boat except for the captain and crew. This premium charter is ideal for families with kids. They offer 4 hour or 6 hour trips, but will do longer trips for those who want to go further offshore. The 6 hour private charter is $1,300 for 6 people, plus deckhand fee and is our most popular 6 passenger charter. During the summer, they depart at 6:30 and at 1:30 pm, which is ideal for those who want to fish early or sleep in late. The 6 hour fishing charter is the best trip around. This trip takes you out to the deep sea and stop the boat over a reef where fish are found. The 6 hour allows everyone to hold a pole and drop their bait below and wait for a fish to bite. The 6 hour charter is ideal for catch and release or catch and keep. You normally catch Red Snapper, Triggerfish, Grouper, Amberjack, Red Porgy, Vermilion Snapper and many more species. If you would like a private fishing charter and have 1 to 6 passengers, please fill out the private deep sea fishing reservation form on this site and submit it. We will answer you quickly. Specializing in private charters for 7 or more passengers. 4 hours to full day charter trips available. Private Deep Sea Fishing Charters for 7 to 20 passengers is run on the Intimidator Charter Boat and is also docked at the Orange Beach Marina. The Intimidator is a 65' Custom Sport-fisher and has an inside sitting area that is air conditioned and has private restrooms. A private charter is where you are the only one on the charter boat. 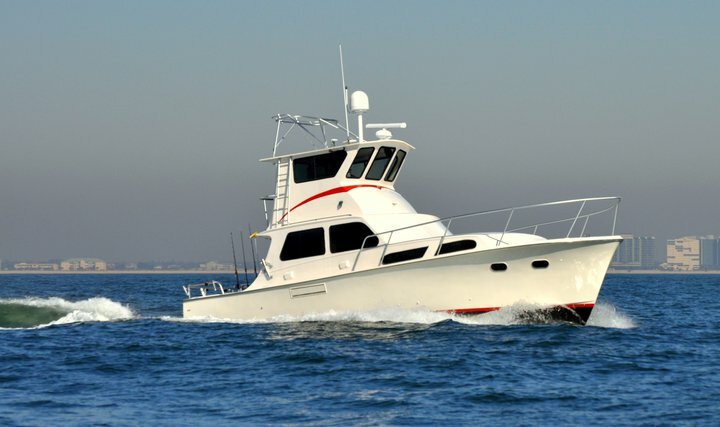 This charter boat is ideal for offshore fishing for either 4 hours, 6 hours, 8 hours, 10 hours, 12 hours or over night. The 4 hour private charter starts at $1000 plus tip for the first 10 passengers. For each person over 10, the person wil pay an additional fee, per person to go. The most popular 6 hour private fishing charter in Orange Beach is $1,600 plus tip for 10 passengers and a percentage for each person over that and up to a maximum of 20. The 4 hour charter is trolling only. The boat stays near the shore and drags lines behind the charter boat until a Spanish Mackerel, King Mackerel or a Bonita strikes the line and then you fight and reel him in. The 6 hour fishing charter is where we take you out to deep sea areas and stop the boat over an artificial reef. 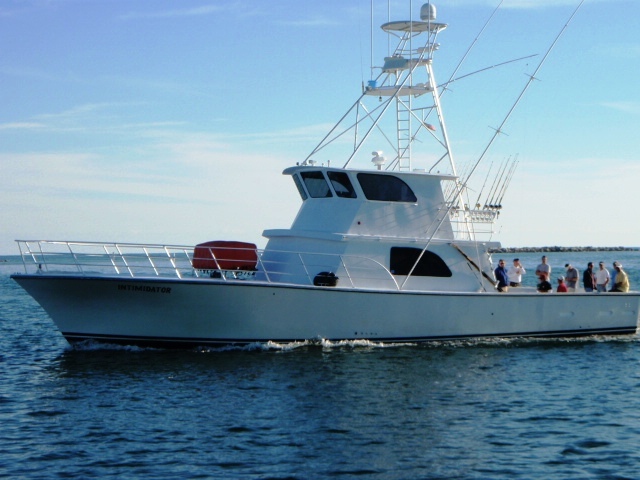 This is our most popular multi-passenger fishing charter in Gulf Shores. This is where everyone holds a pole and drops their bait below the boat waiting for a bite. The 6 hour charter is great for catch and release or catch and keep. You normally catch Red Snapper, Triggerfish, Grouper, Amberjack, Vermilion Snapper and many more species. If you would like a private fishing charter and have 1 to 6 passengers, please fill out the private deep sea fishing reservation form on this site and submit it. We will answer you quickly. Specializing in private 6 hour and 4 hour, Back Bay and Inshore fishing trips in Orange Beach. One of the most popular fishing charters in Orange Beach is the inshore and back bay fishing trip. We have JayHook Charters. These back bay boats do not have restrooms, but you are only minutes away from land or Orange Beach marinas when fishing. These boats are 22 to 24 feet in length and are center consoles. This means you can walk around the boat while inshore fishing. These boats can carry up to 6 passengers per charter, but they are more comfortable if you have 4 people. That way you don't have to cast over someone else's line each time. The inshore boats offer 4 and 6 hour trips. They fish near the jetties, under bridges, under piers, near channels, drop offs, structure or simply drift fish over oyster reefs. When fishing is tough in Orange Beach, these boats may have to move and be picked up from a nearby dock where the fish bite is better. Their goal is to put you on the fish and sometimes, you have to be flexible and move if you want to catch them. Inshore fishing usually catches fish like Speckled Trout, Redfish, Pompano, Black Drum, White Trout and Sheepshead. The prices for a 4 hour inshore charter starts at $500 plus tip for 4 people. If you have extra people up to 6 max, add $100. 6 Hour is $650 for 4 people. If you have more than 4 people, add $100. If you want to go inshore fishing, please Jayhook Charters and submit this form. You may only choose one boat for your reservation to be submitted to. However, you are welcome to hit the back button and choose the other boat and submit the form again to send to your other choice. Both companies are excellent, but they fish all day long.